Image courtesy of Mike Pittard. 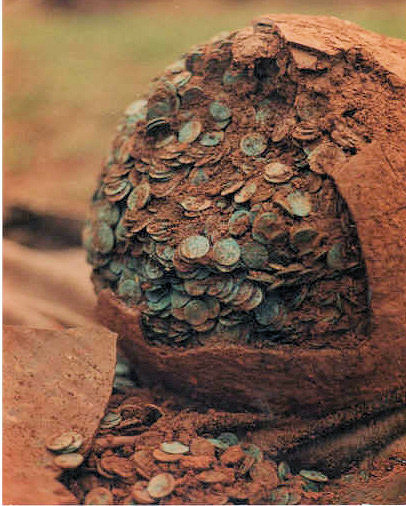 This massive hoard of 22,670 Roman coins was found by Mike Pittard whilst metal detecting in a field near Nether Compton on 19th February 1989. The field is by the side of a trackway, the other side of which is a known Roman building. The actual finding of the hoard was photographed and report was published in The Searcher magazine (Issue 44, April 1989). The hoard was deposited with the Dorset County Museum in Dorchester by the finder in 1989. It was subsequently returned to the finder, sold and dispersed through the trade in 1994. No detailed record was made of the content of the hoard. The pottery vessel and some 33 additional coins that had remained stuck to the pot were donated to the museum and remain there. Although Nether Compton was never recorded or published, a limited amount of information has been gleaned from people who have handled it or part of it – this was finally published in Coin Hoards from Roman Britain Volume XII. It was a very large mid-Constantinian hoard and typical in composition, all but about 7% consisting of the very common bronze issues of the AD 330s (the Urbs Roma and Constantinopolis commemoratives and the Gloria Exercitus Type in the names of Constantine I and his sons). There were no coins of the two Victories type suggesting that the hoard was deposited around AD 339. The latest estimates are that there were about 20,000 to 21,000 Gloria Exercitus (two standards and onestandard types) and 1,000 to 2,000 Urbs Roma / Constantinopolis commemorative types. There were no later types but around 600 earlier coins, the earliest dating back to Aurelian or before. Other Constantinian period hoards found in Britain of comparable scale are the 11,460 coins from Thornbury (due to be published shortly) and 17,548 coins from Bishopswood (Numismatic Chronicle 1896). In both cases these hoards were deposited later as there were coins of the two Victories type (AD 341-8). 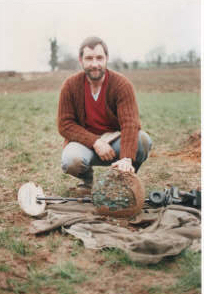 John Oswin of the The Bath & Camerton Archaeological Society has recently carried out a geophysical survey of the area where the hoard was found and the report of this survey is recorded here. Mike Pittard and the hoard.